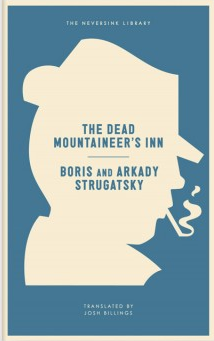 The Dead Mountaineer’s Inn is a classic detective-noir novel from the masters of Soviet sci-fi, Boris and Arkady Strugatsky. It’s the first book of theirs I’ve read, and the first two thirds had the wonderful effect of transporting me to a cozy vacation setting in a remote mountain ski chalet populated by an eccentric cast of characters. Fun! We had a rich old man named Mr. Moses with a beautiful wife who was probably not his wife, a physicist, a magician and his gender-ambiguous young relative, the scheming inn-keeper and of course the vacationing police detective, Peter Glebsky. I wanted to curl up by the fire and drink “hot port with spices” and listen to the avalanches in the surrounding mountains while various people went thump in the night, traced wet footprints down hallways, canoodled, and got stupid-drunk. Unfortunately, I read the book in translation (a Neversink Library edition with an introduction by Jeff Vandermeer ) and thus missed probably the best running joke, which is writing a gender-ambiguous character in Russian, which is difficult to do because of the way the language genders its verbs. I found the denouement a bit frenzied, with too much detecting and too little sitting around enjoying the pleasures of the mountain location. But the upside to the book’s end was the neat way that the brothers upended the virtues of policing and values of the detective novel. Vandermeer’s introduction puts some of this in context with their fraught status with the Soviet publishing authorities. They were supposed to write a simple genre book with positive social values…. which of course these true artists and oddballs couldn’t quite do. To their great credit and to the book’s advantage. I would love to co-write a book. I can totally imagine it. It would have to be with a like-minded friend, but I have a few. Maybe this is because I was an editor and am used to a collaborative writing process.